It can stand up to the harsh environment of a busy kitchen or bathroom, but sometimes it needs a little extra love. Laminate is a hardy material that can take quite a beating and keep its relatively shiny disposition. However, over time it can get cloudy or dull. Whether its layers of years of hard use or a build-up of cleaning products, laminate countertops can regain their youthful glow with the proper products and techniques that require just a touch of elbow grease. Although laminate seems durable, it does have its weak points. You should always use a cutting board for even the smallest of jobs. Keep bleach or other harsh chemical household cleaning products off of the surface of the laminate countertop to keep drips or all-out spills from discoloring the laminate. Try not to push heavy objects, such as clay pots or small appliances, across the surface of the laminate. These can cause small scratches or gouges. This will not only make the laminate look old but dirt, grease and grime will build up in those crevices to create a dull finish. Laminate lays there day after day during all the chopping, batter blending and heating that happens in the kitchen or through the endless rotation of primping people who clutter the surface of the bathroom countertop with lotions, cleaners, heated hair irons, dryers and rollers. It needs a good going over once a year to keep it in its best fighting shape for all it endures throughout the year. Remove all of the items on the counter for a clutter-free surface. Take a clean, soft cloth and a gentle cleanser, such as a mix of 1 part water and 1 part vinegar, and wipe down the entire area. Use a vacuum to get into the corners and a toothbrush to flick out any leftover debris in corners, cracks and crevices. Soap and water work just as well, too, but just make sure to wash it thoroughly so no soap residue is left on the laminate. Take care for serious stains and use a serious cleaner. There are many countertop stain remover cleaners on the market that can get tough stains, such as coffee or grease. A paste of baking soda and vinegar or lemon juice can also get out stubborn stains. There are many brands of laminate, including the longtime maker of the durable countertop material, Formica. The company has a long list of tried-and-true cleaners for its products. 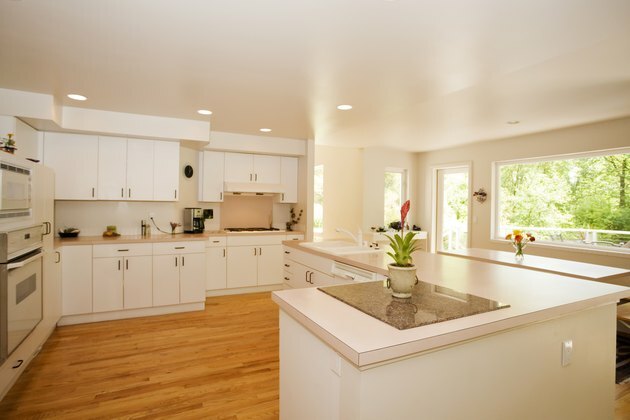 A Formica countertop cleaner can be used for any laminate. To make it shine, use a mild car wax in a light layer. This will bring out the faded color, as well as leave a protective coating to keep the laminate at its best all year long. Waterdrops is a car cleaner that uses little water, gets the countertop superiorly clean and dries quickly, which cuts down on streaking issues.